It was believed that Belgium Air Force 10 Wing from Kleine Brogel AB had a squadron exchange with the Italian Air Force 154 Gruppo (6 Stormo) from Ghedi AB. It is not sure if this was a 2-way exchange but at least the Italians came to Belgium where a number of aircraft were seen on 23 February 1971 being MM6550/6-08, and unknown MM serial with code 6-22. 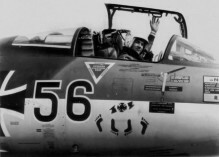 It has not yet been confirmed, since it could also have been a cross-country mission in stead of a squadron exchange. Who can confirm? 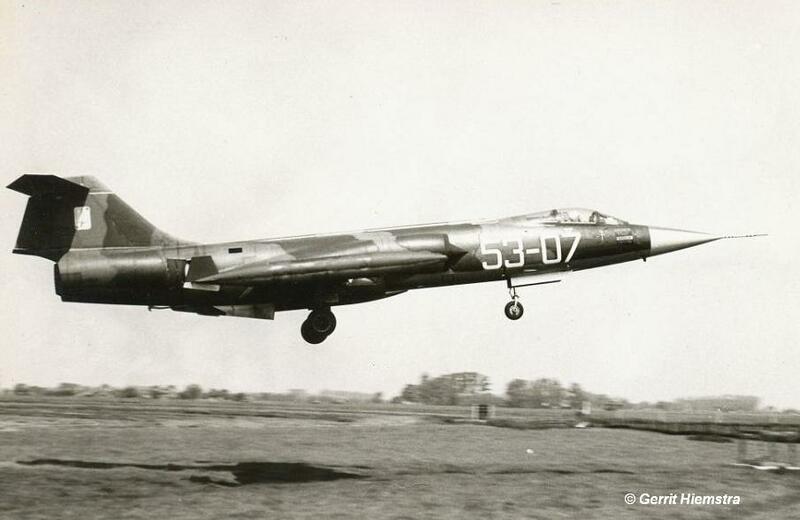 This month there was a exchange between the Danish Air Force 723 Eskadrille and the Dutch Air Force 311 Squadron, both operating the F-104G Starfighter. It was a two way exchange. The Dutch Starfighters arrived back at Volkel one day later (April 4th) then the Danish Starfighters flew back to Denmark. Danish aircraft seen at Volkel AB were R-347, R-753, R-755 and R-756. This month there was a exchange between the Turkish Air Force 4 Wing, based at Murted AB and the German Navy squadron MFG1 from Schleswig-Jagel. It was a one-way exchange where the Germans flew to Turkey with 6 Starfighters. 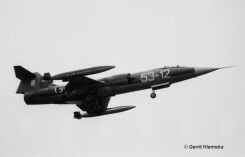 Belgium Air Force 23 Smaldeel (10 Wing) from Kleine Brogel AB, operating the F-104G, had a squadron exchange with one of the Canadian Air Force squadrons at Baden-Sollingen flying the CF-104. It was a one-way exchange, only the Belgium Starfighters visited the Canadians in Germany. This month there was a exchange between the Royal Air Force 29 Squadron, flying the Lightning fighter aircraft from airbase Wattisham, and the Dutch Air Force 322 Squadron from Leeuwarden AB. It was a 2 way exchange. 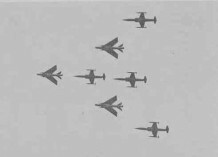 The five participating Dutch aircraft at Wattisham were D-8049, D-8058, D-8104, D-8308 and D-8311. Photos beneath show the Dutch pilots after arrival in the UK while offering wooden shoes to the RAF squadron leader. He tried them immediately while pilots Toon van der Heiden (left) and Harry Besterveld received beer. Toon is seen here wearing wooden shoes as well. The other photo shows the Lightnings arriving at Leeuwarden Air Base (only 3 participated?). (Photos thanks to 322sq). This year the Italian Air Force 21 Gruppo based at Cameri AB exchanged with the Royal Air Force 19 Squadron flying the Lightning F.2A at Gutersloh, Germany. It was a 1 way exchange where only the Lightnings flew to Cameri. By that time 21 Gruppo was converting to S, so they still used a mix of G and S aircraft. It was confirmed that 21 Gruppo participated in two exchanges this year. First with 323 Squadron in June and then with 19 Squadron later that summer. 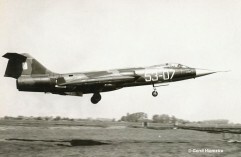 This period the RAF 111 Squadron exchanged with JG71 based at Wittmundhafen flying the F-104G. It was a 1 way exchange where only four Lightning aircraft flew to Germany together with a Canberra T17 from 360 Squadron based at Cottesmore. This aircraft was used during training missions to act as a hostile ECM aircraft. The photo beneath (thanks to JG71 archives) shows F-104G 23+56 which was clearly zapped by 111 Squadron ground personnel at Wittmundhafen. This year the Danish Air Force 727 Eskadrille based at Karup, flying the F-100D Super Sabre exchanged with the Italian Air Force 28 Gruppo (part of 3 Aerobrigata) at Villafranca flying the RF-104G. It is unknown if it was a 1 or 2 way exchange. This month the Canadian Starfighters from 421 Squadron had a two-way exchange with RAF 23 Squadron from Leuchars, Scotland, flying the Lightning. Inside the 421 Squadron book it is mentioned wrongly that it was 1970. This month the Belgium Air Force 350 Squadron (1 Wing) based at Beauvechain AB and operating the F-104G Starfighter, exchanged with the Italian Air Force 22 Gruppo at Istrana operating the F-104S. It was a 2 way exchange. 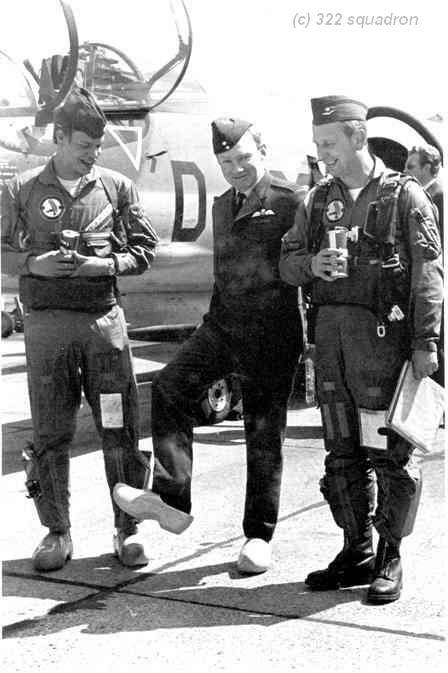 The Lahr based Canadian Starfighters from 441 Squadron flew to Great Britain for a squadron exchange with RAF 43 Squadron based at Leuchars and flying the F-4 Phantom FG1. 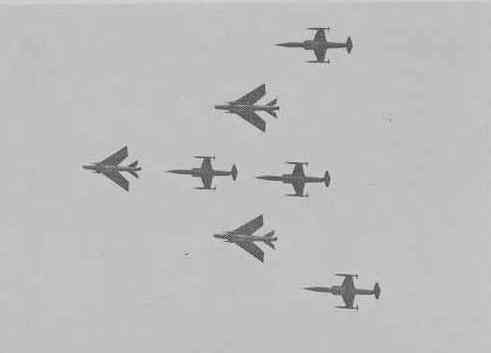 It is unknown if the Phantoms also came to Germany but in total six CF-104s flew to Leuchars including CF-104s 104739, 104761, 104788, 104835 and 104895. Sadly we still don't know the 6th aircraft. This month there was a exchange between the Italian Air Force 5 Stormo 102 Gruppo, based at Rimini AB, still flying the F-104G and the Dutch Air Force 306 Squadron based at Volkel AB. It was a two-way exchange spread over two periods after each other. Italian aircraft seen at Volkel were F-104G MM6524/5-09 and MM6533/5-06 only. Six Dutch Starfighters in Rimini were RF-104Gs D-8013, D-8059, D-8107, D-8119, D-8129 and D-8138 (from October 5th till 14th). Also one TF-104G (D-5806 from CAV) was available at Rimini from October 8th till its departure on October 11th. It also came back at Rimini on October 13th. This exchange had two pre-visits. First of all RF-104G D-8125 together with TF-104G D-5807 stayed the night at Rimini from August 10th till 11th. and then a second pre-exchange visit took place on September 21st when TF-104G D-5808 flew to Rimini AB. The 306 Squadron logbook shows that the Dutch personell flew with two F-27 Friendships to Rimini on the 5th of October and flew back with an Italian AF C-119 ten days later including a fuelstop at Reims AB. The MM6533/5-06 was seen lateron at Rimini with 306 Squadron badges on its tail. It is very likely that the other aircraft had been zapped as well. 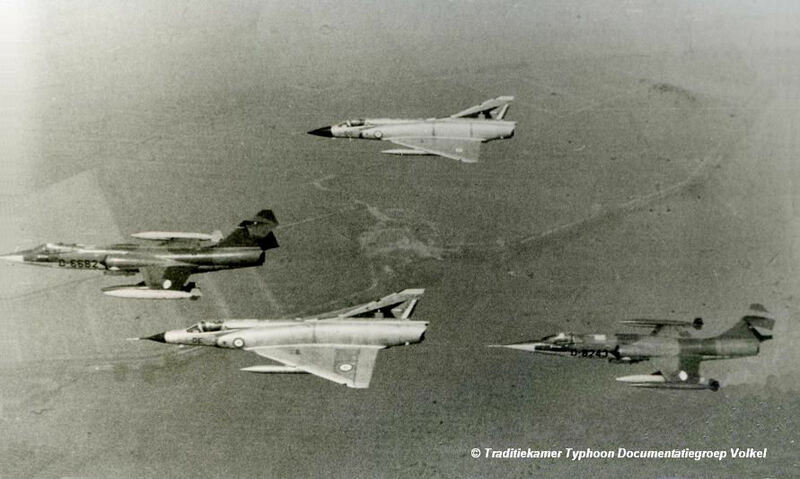 This month there was a exchange between the Royal Air Force 29 Squadron, flying the Lightning fighter aircraft from airbase Wattisham, and the German Air Force JG74 from Neuburg AB flying the F-104G. It was a 1 way exchange. Only three Lightning aircraft flew to Neuburg together with Shorts Belfast transport aircraft. 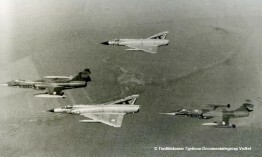 This period there was a exchange between the Greek Air Force 335 Mira, based at Tanagra AB and flying the F-104 Starfighter, and the German Navy squadron MFG2 based at Eggebek AB. It was a one-way exchange where the German Starfighters flew to Greece with 6 Starfighters. The 22nd November they flew via Luxemburg, France, Italy (fuel stop at Grosseto) arriving in Greece around 6PM. Transport was accomplished by a Transall cargo aircraft. This year the Italian Air Force 10 Gruppo based at Grazzanise AB exchanged with the Danish Air Force 726 Eskadrille at Aalborg. It is unknown if it was a 1 or 2 way exchange. 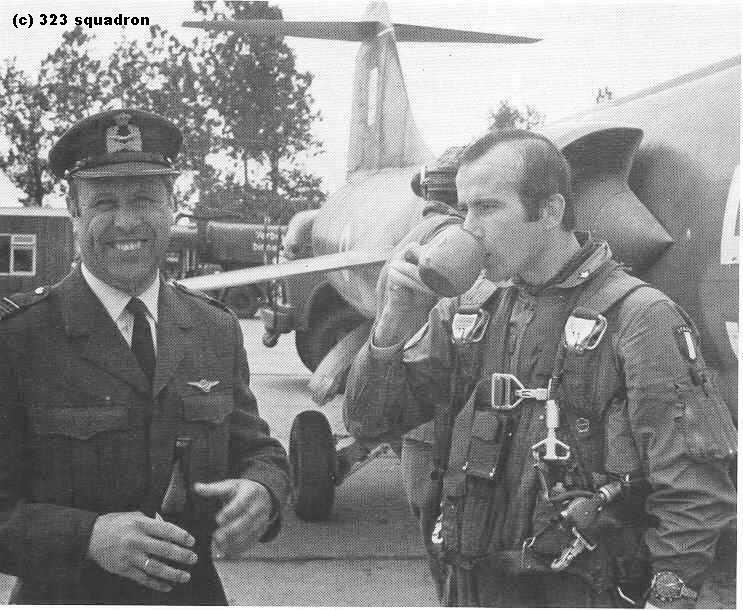 Both operated the F-104 Starfighter. This year the Italian Air Force 154 Gruppo based at Ghedi AB exchanged with the German Air Force JBG33 at Buchel. It is unknown if it was a 1 or 2 way exchange, but at least the Italians were seen at Buchel with a number of Starfighters. This exchange has still to be confirmed. This year the German Air Force JBG34 based at Memmingen, flying the F-104G Starfighter, exchanged with the Norwegian Air Force 334 SKV. at Bodo flying the F-5A. It is unknown if this was a one or two way exchange but at least the F-5s visited Memmingen.